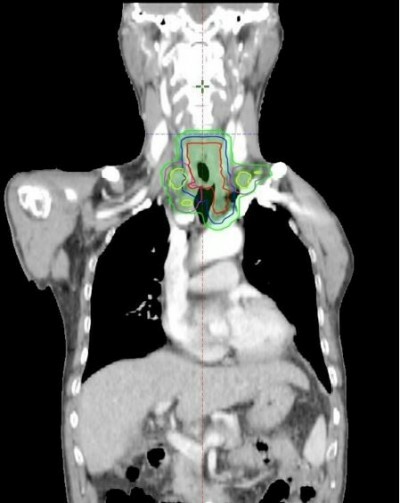 Purpose: To evaluate the capability of 18F-fluorodeoxyglucose positron emission tomography/computed tomography (18F-FDG-PET/CT) to predict the clinical response of metastatic lymph node (mLN) to definitive chemoradiotherapy (dCRT) and guide personalized radiation dose in esophageal squamous cell carcinoma (ESCC) patients. Patients and methods: One hundred and forty-three mLNs from 59 patients with ESCC treated with dCRT and who had undergone a pretreatment 18F-FDG-PET/CT scan were included in the study. All defined mLNs were contoured by nuclear medicine radiologists. Response was evaluated by contrast-enhanced computed tomography and 18F-FDG-PET/CT. Results: Sixty-nine mLNs showed complete response (CR), and 74 mLNs showed non-complete response. The 143 mLNs were divided into 4 groups (Groups 1–4) based on the quartiles of maximum standardized uptake value (SUVmax-G1, SUVmax-G2, SUVmax-G3, and SUVmax-G4) and metabolic tumor volume (MTV-G1, MTV-G2, MTV-G3, and MTV-G4). The CR rate of SUVmax-G2 was significantly higher than the other 3 groups. The escalated radiation dose improved the CR rate of lymph nodes in SUVmax-G3 (55 Gy) and SUVmax-G4 (61 Gy). The lowest CR rate was found in MTV-G4 (the group with the largest MTV). The escalated radiation dose (59.7 Gy) improved the CR rate of lymph node in MTV-Groups 3 and 4. Conclusion: Pretreatment metabolic parameters can predict the response of mLNs to dCRT for patients with ESCC. The parameters could also be used to guide personalized dose to mLNs.